The Universal Serial Bus, or USB for short, is one of the most popular methods of interfacing your devices with your computer. Almost everything will interface this way nowadays, from your mouse all the way through to your speakers or even your smartphone. As with most things on a computer though, from time to time you may be greeted with a USB Device Connectivity Problem. Don’t worry though, these problems are pretty easy to solve. Let me explain how. Firstly, what causes a USB Device Connectivity Problem? 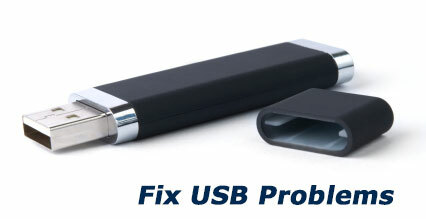 Well, most people think that the issue is caused by a faulty USB Device. In most cases though this is not the problem. In fact, the problem is somewhat simpler. It is down to faulty software in your computer. This software is known as a ‘driver’ and basically provides the connection between your device and computer via USB. From time to time drivers are prone to errors, like all pieces of software out there. Thankfully though, it is fairly easy to fix the problem. This is because as soon as a developer notices that there is a problem with their software they release an update. The problem for you however is that these updates are not automatic and this means that you are going to need to solve the problem yourself. Now, with a USB Device Connectivity problem there could be one of two drivers causing the issue. If no device works in that USB port then it is the driver for the USB Slot causing the problem. If only that device does not work then you have narrowed it down to that specific device. Your job is to track down the right driver for your device. The main way in which people do this is to head online. You will need to know the exact brand of the device that is causing the problem, as well as the model number. If you do not know this information then you will find it very difficult to track down the right driver. If you do have the model number to hand then you will want to get the right driver for your operating system! Once you have the driver it is time to carry out installation. There are plenty of ways that you can go about this. Most drivers are ‘auto install’, for some others though you may need to delve into the control panel of your computer and make a couple of edits. This is somewhat more complex. We suggest that you use a piece of driver update software known as Driver Turbo. This is going to eliminate all of the problems above about finding the right driver. This is because it will do everything for you. It will even install the drivers for you! This means that you will always have the most up-to-date driver and you do not need to worry about messing up your computer!